My layout was a freelance railroad based upon the North Pacific Coast and the North Shore Line, and set in the 1920's. 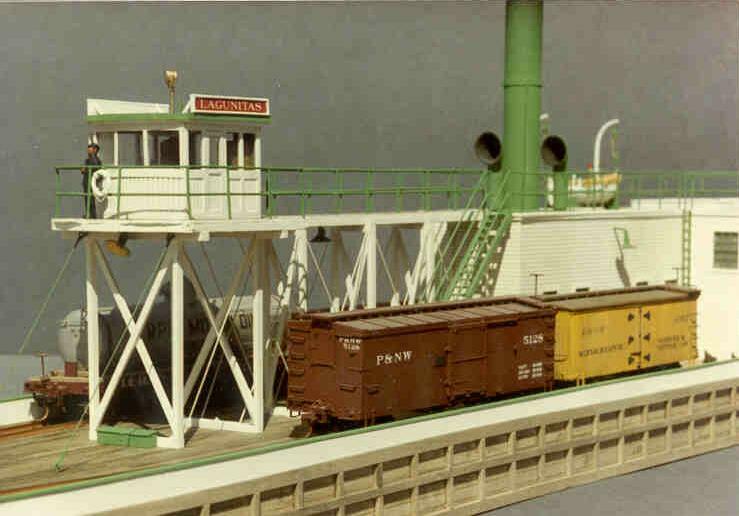 As part of this layout, my ambition was to recreate the entire Sausalito ferry dock, and as part of that, I scratch built the Lagunitas. 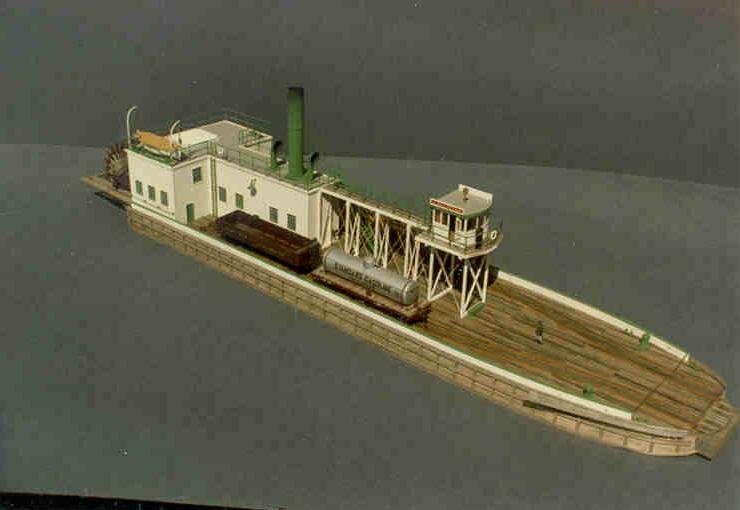 The entire boat took eight months to complete, not including the freight cars. 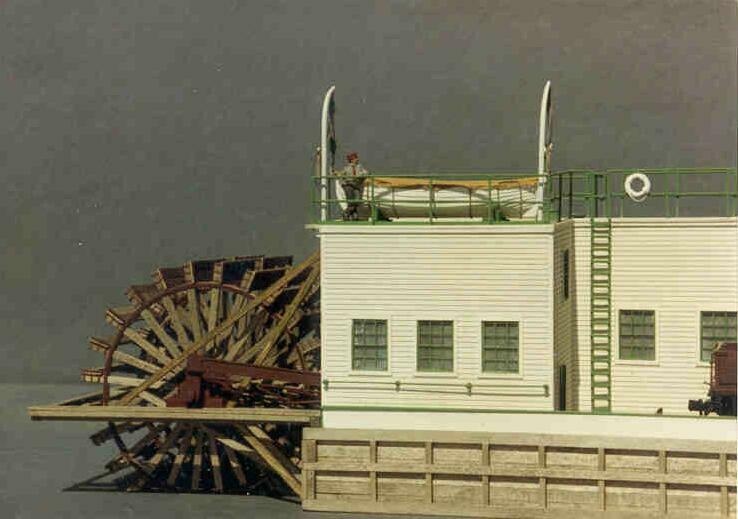 The model won First Place in the Non-Revenue category at the NMRA's 2000 National Convention in San Jose, CA. It also won the Testors Floquil Non-Revenue Award, and won First Place in the Photo Match Contest. Since I built the model ten years ago, and entered it on a whim, no one could have been more surprised than I was! You could have knocked me over with a feather!! 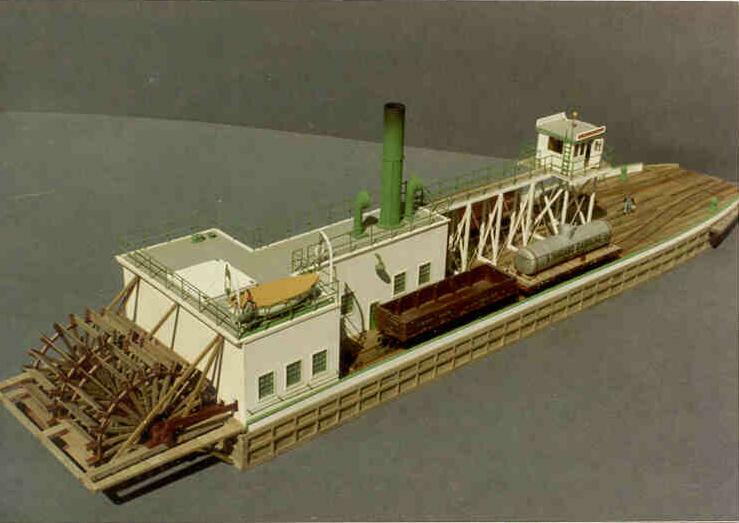 Drawings for a selectively compressed model were created from line drawings supplied in the book, "Narrow Gauge to the Redwoods" which is recently back in print. The hull and deck were created by laminating board-by-board construction to a shaped, solid wood core. The power house is scribed wood. Rails were hand-laid and spiked. The handrails were created from brass wire and soldered. The stairs are a commercial part, and the freight cars are craftsman kits.. The only commercial parts used were select nautical fittings - the capstans, cleats, lifeboat and davits, tuba vents, searchlight, steering wheel, and life preservers, as well as door and window castings and figures. 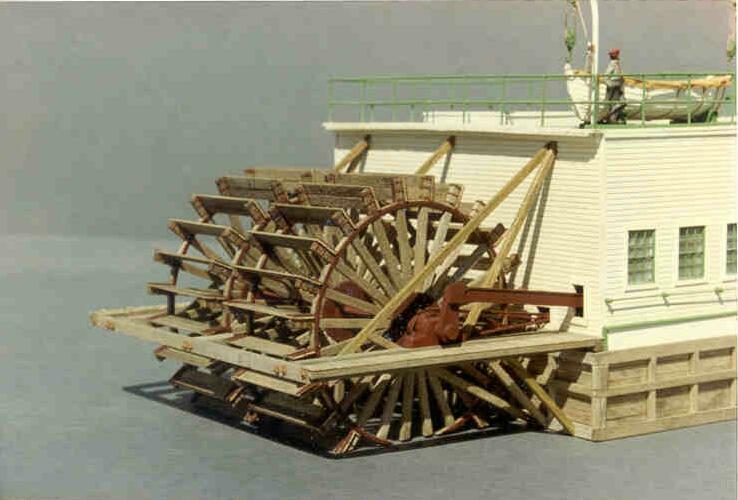 The paddle wheel was scratch built using home made jigs, and was based upon the stern wheel from the Petaluma, which I photographed on the dock of the San Francisco Maritime Museum. Metal hubs and reinforcing rings were turned from sheet brass on my Unimat. More than 2000 rivets were individually embossed to simulate the small bolt heads holding the paddle wheel together. 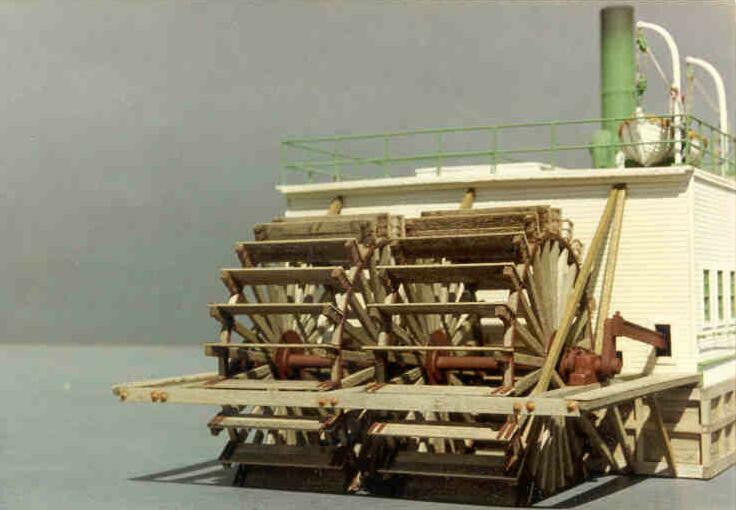 The drive rods, eccentrics, valve gear, and bearing blocks were scratch built from styrene. This is the real Lagunitas. She was built for the North Shore by W.A. Boole and Sons in Oakland, and was launched on February 1, 1903. She carried narrow gauge freight cars from Sausalito to San Francisco until 1908, when she was converted to handle standard gauge cars. She was retired in 1921. This is the Sausalito ferry terminal in 1903. 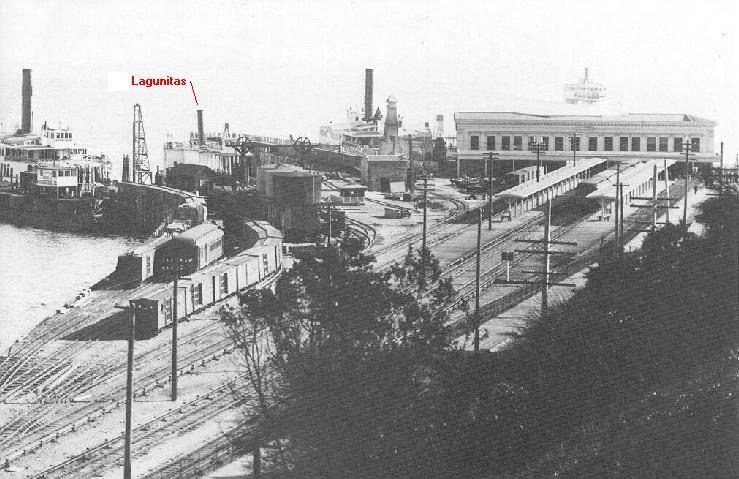 The Lagunitas, brand new at the time, can be seen in its ferry slip. Two other ferries are also moored in their slips, with another approaching the terminal building, above the roof and barely visible through the fog. Note the dual-gauged tracks and the electrified fourth rail. I still might try and build this someday.